Davis-Besse was back online this morning at 4:25 AM according to a number of local news sources. The Cleveland Plain Dealer is reporting that the plant was operating this morning at about 21% PRx and that FirstEnergy will increase output over the remainder of the week. Because Vermont Yankee is in the spotlight right now for two reasons (contaminated ground water, and the state legislature's decision not to allow an operating extension past next year) it might be good for the sake of complete coverage to check out the information and slant found in this article. This is one of those kinds of articles that haunts the ear but confuses the mind; on first read it sounds fairly condemning but on second read, to those of us who know what's what, it isn't really that serious. At least not to me. But, hey; I'm pro-nuclear. "Pro-nuclear" with experience directly with nuclear power, that is, not anti-nuclear with no experience whatsoever with nuclear power. I'm not making a comment against the author with this assertion; I'm just stating my position, which those who read this blog regularly already know. Anyway, check out the article so you're up to speed. Vermont- are you reading this? Considering the fact that the Vermont legislature thinks that extending Vermont Yankee's license would be a bad idea, and that it would rather rely on the grid at large and power sharing schemes to provide the one third of Vermont's power supply that cessation of operation at Yankee would vacate, it might be a good idea if they'd read this article. What they should pay attention to is the very high capacity factor that Yankee has and the very low factors accomplished by everything else. This article published today is an excellent summation of the Pacific Northwest's experience with and view toward nuclear energy over the last several decades. Of course, there is the usual error so common now that tells us that TMI-2 and Chernobyl killed off nuclear energy here in the US (remember that the orders for new nuclear plants had already tailed off and stopped, and project cancellations started before TMI happened with no new contracts since 1978) but we can excuse that for now. This article is another in a great string of very sensible summations of nuclear energy in terms of correcting the mass viewpoint and I like it. Most amazing is the 62% "for nuclear" Gallup poll result. It's time! I've added links on the blog page to represent both of Bechtel's general nuclear energy concerns; namely, its original design and contracting business, and its much more recent (2008) operation of both Bettis Atomic Power Laboratory and Knolls Atomic Power Laboratory which were formerly operated by Westinghouse and Lockheed-Martin. Knolls was originally operated by General Electric. Bechtel's next major project for the BMPC operation appears to be the A1B reactor plant for the next generation of aircraft carriers, to be known as the CVN-21 class. There is a good description of Bechtel's history and operations to be found here. 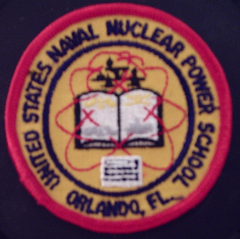 The United States has completed the latest of a very long line of almost totally successful* nuclear power plants; that aboard the USS New Mexico, which commissioned in March of this year. The New Mexico, SSN-779, is powered by a General Electric S9G reactor; the stated shaft horsepower for this plant is 40,000 SHP. The history of both Westinghouse and General Electric as regards the US Navy's Nuclear Power Program is absolutely one of the most fabulous episodes in all of the history of atomic energy and should be told completely some day. (Combustion Engineering was responsible for exactly one plant design and although Allis-Chalmers tried a very early concept under contract, it was dropped.) Yes, there is some good nuclear news to report. *-- The S1G/S2G plants that were sodium cooled, beryllium moderated were not successful; the S2G plant on board SSN-575 was replaced with an S2Wa pressurized water plant. The Soviets didn't get the hint and spent billions of rubles on lead-bismuth cooled plants (and a pier-side steam plant) for the Alfa class-- an expensive blunder they'd probably rather forget. I notice today on the wires that Vietnam has announced intent to place online a fleet of nuclear power plants by the year 2030; this follows the equally slightly improbable announcement by Nigeria that it intends to have nuclear energy by the year 2019. The reasons for both to develop nuclear energy are obvious, in terms of oil independence, but one wonders about the complete lack of technological base in each nation. What neither lacks, apparently, is initiative. We used to have initiative here, before the environmentalists got involved in the 70's. 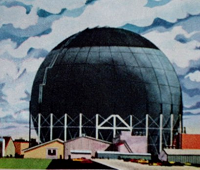 Atomic power was the way to the future, it was envisioned, and would allow many labor and time saving conveniences which would naturally require a massive electric generating base. The fact that our base is inadequate without the fleets of electric trains and artificial biospheres and such that were envisioned is all too easily proven by the constant power interruptions in major cities and even small ones, for various reasons. That says nothing about the 'Great Blackout' a few years back. In reality the need for nuclear energy didn't go away; our perspective changed, weighted as it was by a decidedly biased and vocal minority, and that led to a loss of intiative. The initiative has been lost to the point that where once the United States led the world in atomic energy, it now cannot entirely build any plants with all-US companies and materials. For many of us, this is a shame. What will happen in Nigeria and Vietnam? Well, if history is an indicator we might figure that we'll lose out on those prospects too. After all, the UAE contracts went to South Korea. South Korea, using French designs developed originally from US-based Westinghouse plants, but South Korea nonetheless. Well, vacation's over in 20 minutes. That was too fast. I think I need vacations more often than every nine or ten years. DAVIS-BESSE has been given NRC permission to start up following CRDM nozzle repairs to alleviate stress corrosion cracking; the plant is expected online next month. DIABLO CANYON today had a site alert when a fire suppression system test released excessive carbon dioxide into a lube oil tank room. The plant continued at full power; we don't at the moment know which plant it was. 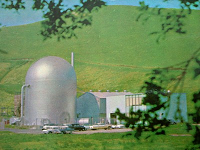 Diablo Canyon 1 & 2 are both Westinghouse 4-loop PWR's rated 3411 MWt / 1120 MWe, and went online in 1985-1986. VERMONT YANKEE now has a cooling tower leak, as reported by UPI. This is nothing major, and in fact barely worth noting except that this plant needs no further publicity of any kind right now. This water, for those unaware, is totally clean water that's used only in the cooling tower circuit, for lack of a better concise description. No news would be good news is my point. Daya Bay 2; I told you so. We just looked around enough to get confirmation of what we wrote on June 15th (see the entry if you'd like) -- the "radiation leak" at China's Daya Bay 2 plant was a minor fuel element failure. Operation continues as expected. Yes, Osorb. Supposedly, ABS Materials of Wooster, Ohio has a material made from silicon polymer that can absorb eight times its own mass in oil, which can then be removed later. They're proposing it for use in the Gulf of Mexico; this article gives some details. Just a note here to confirm in this blog for completeness that Georgia Power accepted the loan guarantee made by the Federal Government through the Department of Energy on June 21. Loan guarantees were also made to GP's partners in the project. Vogtle 3 and 4 will be Westinghouse AP1000 plants; see the Westinghouse link on the right to find details and a full downloadable pdf file brochure. Entergy has revealed that the tritium leak to groundwater was due to a very likely unforseeable combination of circumstances, related both to underground pipe corrosion and inaccessibility for inspection and also related to how later, supposedly non-interfering construction on-site can affect already built piping systems. Suffice it to say that this writer doesn't think that Entergy or anyone involved was evasive about this- they didn't originally understand the problem. It's been given a workaround and tritium deposition to groundwater cut. Unfortunately, in Vermont the state legislature has say over nuclear plant operation and licensing and voted overwhelmingly against extending Vermont Yankee's operation beyond the previously scheduled March of next year. According to World Nuclear News, Vermont Yankee provides one third of Vermont's power... but the lawmakers think that energy will be more expensive WITH the plant than without, which of course means they'd rather pay someone else's rates sharing load or else bet on new fossil plants. Brilliant. Vermont- vote them out! Lightbridge Corporation has announced a new all-metal fuel that it has been developing as of this morning. This article describes the savings and benefits without releasing any proprietary data; most interesting is the 30% power increase per volume promised for PWR plants. My vacation is more than half over. I haven't taken a vacation, that is to say a trip of any sort in any serious way in about nine years. I have to say that not only did it really refresh me, but I really think it re-energized my interest in my old hobby by making old friends closer and by allowing me to make some new ones. I also think that I'm re-focused on getting a new venture off the ground, which is APRA and its products. That's for sure. However, vacation still isn't over and I'll get the most out of the last of it! I'm also planning to take the rest of the vacation I'm owed this year. Just so you all know. Last month, a six-times normal Xenon concentration in the air was monitored in South Korea. That spurred looking for evidence of a nuclear test (none found) or some kind of reactor accident. Nothing was stated, but North Korea did mention a breakthrough in fusion energy of some kind. Of course, the Xenon could have come from China or even the former USSR. That is why right now this article is interesting - it mentions research programs here that would essentially release Xenon to atmosphere. Because of pressure from the NRC, Davis-Besse will get its new reactor vessel head in a 2011 shutdown, instead of waiting through until a previously scheduled time in 2014. Several sources are reporting that the head is ready but still in France, awaiting shipment by Areva. With any luck, the plant will get itself off the radar screen after this happens. This isn't commitment. It's lip service. I found an article at the Jacksonville (Fla.) Times that really details how a utility should NOT position itself for the nuclear resurgence. The only thing they did, really, was say "we might throw in on something that'll pay off twenty years from now, or so.. maybe." We don't need people or utilities or local or state governments giving lip service to nuclear energy; we need either commitment or silence. The pros and cons are known; the history is known (apparently not by the author of the linked article, though, who credits TMI with the cutoff in nuclear plant building that had already happened) and the lead time is as short as several years for a committed utility and community. We could do without comment from JEA, really, in this case. No update was made for Saturday nite; I was too tired! The meeting that Richard held was, due mainly to Richard but also due to the input of everyone involved, EPIC. Further attendees included Alan Seaver (soon to be made co-webmaster of my sites,) Mike Brown, Jack Knarr, William Lawson, Jerry Lee Atwood, Devin Thompson (Duffymoon!) and his wife, Jett Morton and his fantastically supportive and fun parents, Gabe Burbano and his wife and son, and all the folks mentioned previously on the blog here. I hope I am not leaving anyone out - if I did I'll make an edit! Events took place Saturday at Richard's all day, with dinner out in town at a German place. (Awesome Wiener Schnitzel a la Holstein, by the way.) Sunday was a movin' around day with the big antique show down in Kentucky, brunch in Burlington, Kentucky at a really trendy and happening bistro, followed by a tour of Richard's office and then a little wind-down at Richard's. In whole, the functions were grand, including lots of showing and telling. Machines from collections all over the eastern and upper midwestern US were displayed, and we saw Richard Polt's collection both at home and at his office. I was given a personal tour later on of Richard's workshop which is really just as perfect as you could get, and Richard and I finished the afternoon not only talking typewriters (that means pulling out machines, looking at patents and past articles and his massive reference library) and discussing many, many past, present and perhaps future events but also eating one more kind of local cuisine (Skyline Chili- awesome!) and taking a scenic tour of local highlights. I'm very sure that ETCetera will feature a writeup, as will probably Typex, so I won't go into detail here blow-by-blow except to say that this weekend's events were better than I could have imagined. I reinforced a number of internet-only friendships that have existed from the halcyon days of my constant website work and work for ETCetera, and made a bunch of new friends too. The machines were fabulous, and the stories and laughs were even better. Just absolutely grand. This article, by Rod Adams, is a reprint of a 1996 article he wrote wherein he challenges the assumption that in order for nuclear energy to be cost effective, it must be developed in very large core sizes such as were being constructed near the end of the first building phase of plants here (around 3000 MWt, and ending in 1978). It's enough to make you wonder whether or not "let's get going with nuclear" is going to decide to analyze and wait for demand, or replace existing generating capability with large plants, or just get going and start building anything we can use. Adams' concept of jumping on the learning curve, as he puts it, is surely as much sales pitch as it is common sense as related to his article's content and I'd sure like to see some of these small plants that have been discussed for decades finally get built and put through the ringer. Now, having completed my semi-daily self-imposed requirement to dig for atomic power news, it's back to getting ready for DAY TWO of the typewriter collectors' gathering that Richard Polt is having here in Cincinnati. It's storming outside right now, but that should clear out. I think. What a great day! After a truly event-free drive, and a quick clean-up, it was off to Richard's place to meet with some long-time friends that I'd never met face to face. At Richard Polt's house when I got there were Peter Weil, Marty Rice, Herman Price and Travis Hamric. Maddie Parra showed up later, as did another of Richard's friends, Felicia. After a great dinner at a really happening Indian restaurant in a wonderfully alive, busy part of town, we all went back to Richard's to unload our machines and an impromptu show-and-tell broke out. Machines everywhere; stories abounding! It was great fun and a great introduction. Really looking forward to tomorrow; more friends showing up, more machines, more activities.... and pancakes! About to depart here within 20 minutes, just a bit "ahead of the advertised," to borrow a railroading term. That means that the next time you'll hear from me will be when I log on in Cincinnati later today after arrival at my hotel. Then it's dinner with a few collectors this evening before the big get-together tomorrow. It's already hot outside here and I have a feeling that goin' south it won't get any cooler. Luckily, the A/C is working fine in the car and it has tinted windows! I'll post on arrival. About T minus 2 hr 50 min until launch here; expecting to arrive at my hotel around 3 or probably 4 PM down there in Cincinnati. Full tank of gas, and first experimental deployment of Prestone (tm) BUGWASH washer fluid. They make promises. We shall see. I'm considering a plan deviation upon departure since I could conceivably go north on I-75 and swing by Piqua, Ohio to photograph the Piqua Nuclear Power Facility. It's easily visible from a nature path built right by it. Not sure yet. Wouldn't that make this really kind of the Mecca pilgrimage overall for me? Very new news as of this post; Sweden has decided to scrap its 1980 plan that called for phasing out all 10 of its nuclear reactors by this year, and in fact will replace them. The vote was close (two vote margin) but it passed. Normally I don't report too much on nuclear news outside the USA, but this seems significant in being a national reversal of policy. Repairs to the Alpina are complete; the last consisted of gluing back in some loose soundproofing pads inside the ribbon cover. Now it's ready to go. I sure hope that someone gets a lot of enjoyment out of it- and I hope whoever gets it doesn't already have one. In fact, I think I'll make that a set criterion. I have satisfied most of the requests for typewriters that other collectors might like to see, but I've also included a couple of surprises that are sort of wild. Not your run-of-the-mill typewriters. Several of them are "only one in captivity" examples! Now I've just got to finish laundry, put together a travel bag and shaving kit, finish writing out directions, pick some outfits to wear, maybe get some dinner, and then get to bed before 1:00 AM. Yeah, right! Poll: Do you favor the expanded use of nuclear power to meet the world's growing energy needs? This link goes to a poll at the MARKETWATCH special report on nuclear energy. When I looked at it just now, the "for nuclear" was 90%. Against was 7% and 'don't know' was 3%. That's the most favorable thing I've read in many years in terms of public opinion on any poll. This article and related features, linked conveniently, give a good idea of the level field that nuclear energy finds itself on now. I'm linking it from here for general interest. One small fault-finding; the article says that "in 55 years of nuclear plant operation no one has been killed in a plant accident" or something very like that. If you count only civilian power, that'd be right- if you include military power, we all know that three men died at the SL-1 plant at NRTS Idaho. Dave and I just finished making the mechanical repairs and tweaks to an ALPINA that I'll be bringing down with me to the meeting. It's an old green one, serial 96228 and it's not labeled as Alpina but rather as AMC. It's the oldest Alpina-made AMC I've seen. Since I have a green Alpina in the 130,000 range, and two late gray and white ones (one an AMC and the other the only known AVONA) I'll be more than happy to give this one away. It's in good enough shape that you could enter the typing contest on it. I have begun to gather other machines to bring along with me by request; one of those is the Groma Combina. What a horrible contraption. Maybe if it were new and well adjusted it might be all right, or at least OK but at this point it's really not a good machine. The devil's in the details and the redone details to take the Groma portable from regular machine to removable carriage machine are just not well done. We have a number of machines with removable carriages (like the SIEMAG) or type baskets (like the Blick 90) or whole typing action units (Pittsburg, Reliance, Imperial) and most of them are better than this Combina. It's true that the only online story about one I found and translated was about how bad they were. But that makes a rare machine now, doesn't it? Bad then meant low sales then, which meant scarcity shortly in number and in spare parts. It really should be no surprise that the majority of really rare typerwiters are also really BAD typewriters, should it? More details are now out on the incident at Surry 1. It seems that a vital bus was dropped during maintenance, leading to loss of power to some instrumentation. According to reports, feed flow control was lost as were various channels of instrumentation; the reported small fire was in the control room. The NRC has dispatched a special inspection team to the site. Let's take a moment to look more closely at something I mentioned in my previous post - failed fuel elements in nuclear reactors. As I wrote earlier, you do expect fuel elements to fail in any number of ways from minor cladding or canning imperfections and defects to total rupture. It's going to happen, and so long as you don't have a very catastrohic failure that blocks channels or widespread fuel element swelling you may continue operation. In fact, the design analysis that takes place for any reactor includes a well thought out, deliberately conservative number of fuel element failures which would take place over the expected core lifetime. Using that expected failure number results in, for example, a given amount of radioactive content in circulation in the coolant (and largely deposited in crud) and this results in calculable exposure levels which are then used for many further considerations. The point is that it's really expected to occur and that it's usually in reality far less than the design basis. If we look at the design considerations for a major loss of coolant we see that the designers considered that when this happened they'd also assume the maximum credible activity in the coolant from, of course, the maximum credible number of failed fuel elements. Right from the book: "The release of 100% of the reactor coolant to the outside atmosphere would not result in a biological hazard at the site boundary even if the core had been operated for 3000 hr at a power level of 275 MW and the coolant contained the maximum expected activity, ie the activity caused by imperfections in the cladding of about one percent of the UO2 fuel elements (1000 defected elements during the lifetime of the core.)" I could go on and on, but this whole "radiation leak" (author cringes) stuff is hoo-ha if based on a predicted, expected fuel element defect or some such. There is clearly a wide spread of expected problems from minor imperfection to major failure. Again- you can have a serious element failure and a major spike in coolant activity. That's something much more serious, like if for example a fuel plate swells and cuts down coolant flow, furthering the swelling until it ruptures. Even so, this can happen and operation can sometimes continue. Shippingport had a complicated FEDAL system, short for Fuel Element Detection And Location, designed to tap all of the coolant outlets of all the blanket fuel elements to see if any one had experienced a failure in its assemblies. They were ready for this in the 1950's. Let's hope the press keeps itself informed on this sort of thing as nuclear power begins its predicted climb back to the fore of US energy policy. There are some rather exaggerated reports that DAYA BAY 2 experienced some sort of "radiation leak" (whatever that's supposed to mean) and there's an increase in breathless love for fear beginning on the net. Let's stop all that right now. What appears to have happened was a minor fuel element failure. Before you jump me, YES, there are actually major fuel element failures. Fuel elements are always going to experience some kind of compromise in nuclear reactors. Each has many hundreds or even thousands of fuel pellets, or else fuel plates, or fuel pellets or spherules dispersed in a metallic fuel matrix and somewhere, sometime, there might just be a failure at a point. The whole design analysis takes this into account for any modern reactor, and there is actually a planned number assumed to fail during the life of any core. When this happens, samples taken multiple times daily of the primary coolant will begin to reveal FP's (Fission Products) or even possibly fuel in the coolant in trace amounts. This is carefully tracked, and rate of change carefully measured. Everyone knows this will happen and when it does, so long as you don't have a multiple-days-long stratospheric increase you're all right. I can't de-nuclearize, or slim it down for the non-nuclear public, any better than that. It's like having belts on the engine in your car- you KNOW one's going to fail sooner or later. However, the actual number of people who've had a belt break while driving is a fraction of those actually driving. See? So let's not all freak out about some "cover-up" until we hear that they've got something worth covering up over there. Here I am in northern Ohio at about T minus 72 hours and counting until I launch off to the convention for typewriter enthusiasts that's being held down in Cincinnati by Richard Polt. I'll be posting travelogue entries here on this blog and hope to get a full update each day about the events. As I prepare to start to begin to think about possibly scheduling which of my myriad machines I might bring, I'm reminded overall of the vast variety that will be presented and displayed not only by Richard but by everyone and one thing has come to the front of my mind - and that's Beeching's repeated asserticn (which all of us know to be correct) that there was probably no quicker way to lose a fortune than to engage it in the building of a typewriter! Typewriters, believe it or not, were really NOT super-high-profit items to build. Really. They weren't. Sure, the Union typewriter trust fixed the price of their standard machines (office machines, that is) at $100 at the end of the 19th Century so as to control the market and control profit, and profit they did. However, we also know that any company that tried to make a fully competitive but substantially lower priced machine failed, and we know that many lower-quality, lower-priced machines failed too. If you wanted a quality machine you had to get a good design, good materials, good machine tools and great workers, and then you had to have an expensive and well-trained staff at the end of the pipeline to make sure that every machine left the factory in perfect condition, adjustment and alignment. Then you had to ship 'em out very well-packed. The real game-changer was the portable. When it began, the Corona was selling for half the price of standard typewriters but in reality cost much less to make. In other words, the profit margin was MUCH greater. The big companies figured this out first, and very soon they all got into the market. Except Woodstock, that is, which is always kind of a special case no matter the time frame you pick. When you have this in mind as you look at a typewriter, you really get into the machine itself. Operational qualities become fairly secondary as you consider how all of the parts are made and assembled, and how the whole design that began in someone's head was translated through foundry and stamping press and extrusion die and assenbly jig and leather gloves and type bar maul and crate and nails to a real machine in the hands of a real user. I think it's that part I'm looking forward to most from the "typewriter" angle; from any other angle of course it's meeting people I've worked with for years but never met face to face. Overall, as I begin to change my connection to the typewriter world from what it once was (intense, all-consuming, passionate) to what it will be (who knows until you're there.. and then do you, really?) I am really looking forward more to the human aspect and not the mechanical. But for one glorious weekend I'll merge the two and see how that works. Stay tuned. It looks like the waste-burning reactor concept is getting a little closer to reality. Bill Gates' TerraPower has $35 million to put towards its goal of developing a reactor that will use waste from highly enriched uranium-fuel plants as its own fuel for long, slow burns. According to this article, the company is holding some initial talks with Westinghouse (owned by Toshiba... @#&$!) to develop the actual core design details. It looks as if this concept may actually see the light of day after all! This writer detests the ownership of vital nuclear energy interests by foreign corporations, no matter their origin, in case you couldn't tell. 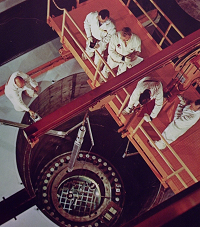 Surry 1 experienced a partial loss of electrical power and a brief nuclear instrumentation fire leading to a scram on June 8th. This article describes the incident as far as is known and indicates an NRC inspection team is enroute. One might suspect a transient leading to an NI power supply failure of some sort, leading to the shutdown but that's just guesswork. Surely we'll find out soon. A minor leak, at least in terms of flow rate, was found and fixed the same day at Vermont Yankee, according to this report. It would seem that this was a primary coolant leak, and not some other cooling system leak, since the report is clear that the water was activated. One wonders if the plant will get extended. Republican senators are proposing a new "Practical Energy and Climate Plan" which will, in part, increase by $36 Billion dollars the loan guarantees from the federal government for new nuclear power plants. See some further details here. 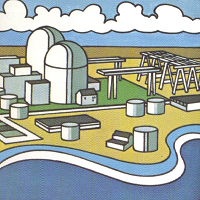 Perhaps not particularly detailed when compared with other reports, but significant nonetheless was the appearance in the syndicated PARADE magazine this last Sunday of a brief article and large map on nuclear energy. The article mentions the push for more nuclear energy, and a statement from the Union of Concerned Scientists ("Hey, we're scientists! And we're concerned!") about emergency planning. Of more interest is the map displaying the 17 sites under consideration for new reactors (21 total) - if you exclude one or two. Brevity and slight inaccuracy aside, it's refreshing to see more and more mentions of nuclear energy in the many various print media and a map in one of those printed outlets showing an array of plants in various stages, and not just one or two in the "maybe" stage. Alternate Energy Holdings Inc. is touting two interesting plans; first, one for a plant in Idaho for commercial power production (Idaho is still the site of the NRTS and so is not 'non-nuclear' in toto but it doesn't have any commercial nuclear plants yet) and second a plan for the construction of nuclear seawater desalinization plants which would produce both drinkable water and some byproduct electrical output. You can see all this on their site. Both plans are very interesting and deserve some further press. The reactor vessel closure head repairs and modifications are complete, according to FirstEnergy Nuclear. According to MarketWatch, a town meeting was held on June 4th to inform the NRC and the public. Alleviation of the stress corrosion cracking of the CRDM nozzles is assured for the interim period until an entirely new head is installed four years from now. The plant is expected online sometime in July, with proper approvals. We've just added a new volume to the APRA library here, which is a part of our historical research for the study on the early history of atomic power in the United States. This volume, "The Economics of Nuclear and Coal Power" by Saunders Miller and which was published by Praeger in 1976 was written at that critical time point at which the economics of atomic power essentially were considered to have turned. As many of us know, it wasn't TMI that made the industry go dormant; no new orders for nuclear plants had been placed since 1978. That was before TMI. This study, performed two years prior to the final orders of the time, is something we've been seeking as a proper endpoint for the first volume of the study and it already appears to contain all the information we'll need on that historical point. Work on that volume, and the first in our monograph series which will cover historical and technical aspects of the PWR project (Shippingport Atomic Power Station) progresses smoothly. According to this article, severe weather damage led to a shutdown of Fermi-2 near Detroit and an outage affecting 35,000 people yesterday evening. As of four hours ago when another news article appeared online, which would be about 3 PM Eastern, Fermi-2 had not restarted due to slight damage to some buildings on-site and also, mostly, due to LOOP (Loss Of Offsite Power.) No restart time has been announced but the plant is clearly safe. Fermi-2 is a GE BWR-I plant, rated 3420 MwT / 1122 Mwe which went online in January 1988 after a protracted construction dating from September 1972, when the construction permit was issued by the NRC. Fermi-2 is, of course, very near the location of the original fast-breeder sodium-cooled Enrico Fermi Atomic Power Plant of much legend in the nuclear energy community. McDonald's- Shrek Glasses containing WHAT?! McDonald's already recalled the glasses, by the way. This sounds bad! Oh, wait.. it isn't. I see today that ten or twelve news articles have exploded onto the net about supposed major problems found when a preparedness drill was run in the vicinity of the Beaver Valley facility in April. Articles like this one try feebly to trump up some kind of fear, but in fact the article is so short that it's really impossible to get all up in arms even if you know nothing about nuclear energy. Why not "Oil Spill Drill Reveals Several Operational Deficiencies?" Or how about "Gulf of Mexico Oil Spill Simulation Reveals Disturbing Results?" See, the problem here is (and has been) the 'golly gosh gee whiz oh my, lions and tigers and bears' mentality that brought us Greenpeace and the movie "The China Syndrome" and which has fueled fear of the nuclear energy field for decades now. Let's just go ahead and compare the physical, social and economic impact of the Three Mile Island accident and.. oh, I dunno... let's pick the Deepwater Horizon incident. Will anyone do that? Yes, they will. Or "he" will. That is, I will. Let's start now. Number of personnel killed directly in all Class V Nuclear Accidents at reactors in the United States: Three (all at one accident, SL-1.) Number of personnel killed directly in Deepwater Horizon Incident: Eleven. The rest of the comparisons will be similar in final result, although very probably in much larger magnitudes. First riser cap attempt on LMRP at 9:33PM Eastern Time... Lots of oil blasting out from under the riser cap. Two ROV's shoved the cap onto the broken flange. Nuke the Deepwater Horizon drill site? Oh, come on.. I won't link the sites, but several supposedly reputable news sources (and several parroting news organizations) have now written speculative articles about using a nuclear device (that's a weapon, folks) to seal off the Gulf oil leak site. Admiral Mullen already said something to the effect of that being way, way, way down the road. Or further. Essentially, that's a "no." Anyone who is wondering now why not should go look up the details on Project Gnome, as just one example. Meanwhile, ROV video seems to indicate that BP is getting much closer to making its first attempt to cap the well. Video stream here. 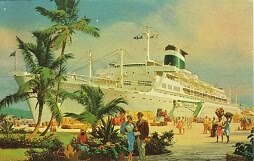 I can't help but think, as I watch the ongoing recovery efforts by BP down in the Gulf of Mexico, about the recovery efforts at the SL-1 plant in the early 60's. In both cases, the actual technology to combat the situation had to largely be invented right there on site. Prior preparation in both cases had, or now has, proven totally inadequate once the real thing hits and minds from literally everywhere converge now as then to solve all of the problems encountered essentially simultaneously. One must think that this event in the Gulf is the oil industry's SL-1 accident equivalent. We must certainly hope that the oil industry doesn't go on to have a TMI and/or Chernobyl parallel as well. One wonders how it could.. and thinking further about the environmental impact, this event could well be the oil industry's Chernobyl sized maximum source term event as an opener. See my earlier post for a link to the BP undersea ROV live video feed. In the last couple days, I've had the pleasure of getting an old AKAI GX-4000D reel to reel tape player working so that we could play tapes of the band (Paul Burton and his Orchestra) that my sister-in-law's grandfather played sax in, and arranged for, for many years. Burton's band stayed around Cleveland, and was a fixture at the Aragon Ballroom for over 30 years and had a weekly radio broadcast from there. We were listening to tapes made in the ballroom, from the feed that was given to AM 850 at the time. Nothing beats analog sound for big band music, and it sounds incredible over my brother's new stereo system. My siter-in-law's dad, Nick Modock, identified some of the solos we heard and having heard the band live many times said the sound reproduction was just fantastic. There are hundreds of reel to reel tapes to go through. While doing that we also had the best coffee ever (EVER, including the whole long history of coffee everywhere) that I made in my newly-acquired but old Pyrex glass stovetop percolator. We also had fun trying to play some old instruments, myself producing some particularly non-pleasant sounds on my birthday gift, which was sis's grandfather's clarinet. That'll take some work, but I figured out at least how to get the right kind of sound. It needs grease but it's otherwise perfect. How's that for a few retro days? A number of venues are now reporting the sale by two investment groups of Electro-Motive Diesel to Progress Rail Inc. Electro-Motive, long referred to as "EMD" was originally the Electro-Motive Corporation which in the late 30's was the main driving force behind developing and selling diesel locomotives in the US. General Motors bought it prior to WW2 and made it the Electro-Motive Division of General Motors, or EMD. This firm held the sales lead for decades until dethroned by General Electric in the 80's. GM decided to sell it off about five years ago to investor groups. This is the thing Cat has wanted for years - and since EMD may have problems with its long-used two-stroke diesel concept in meeting future emissions, the Cat four-stroke diesels may just be the ticket for long-term survival for EMD in the marketplace. Time will tell. Toshiba has actually ordered a pressure vessel - for those unfamiliar, this is a large and heavy long-lead-time item - for one of the two Advanced Boiling Water Reactor plants that it will build for the South Texas Project. The first plant of this type is expected online in six years. It's important to see that the renaissance of nuclear energy isn't just a pipe dream- equipment is being ordered and money is being spent. Is the public more ready every day for new nuclear? If we look only at the fairly dry articles we see increasingly on nuclear energy, such as this one about PSEG who wants to add some new plants to existing sites, we might think "yeah, well it's a nice thought." But if we look at this article it seems to me that the overall perception of threat that the public used to have for nuclear energy is fading into the past. Yes, TMI was 30 years ago; repercussions of that event have rippled through both the fiber of everyday life and the everyday life of the nuclear industry for decades, but the ripples are small and faint now, this far removed. I am heartened by seeing the increasing, if grudging, acceptance for nuclear energy in many venues- some of them formerly openly hostile. As we see at this article, Babcock & Wilcox and Toshiba are going to partner in future efforts to refine and enrich Uranium to support a predicted .. and actually, given present events, very likely .. snap growth in nuclear energy contracts. BP has put up a live link to underwater ROV operations which you can see by clicking here. This feed shows undersea recovery and capping operations any time they're running. Not surprisingly, NPR/PBS is offering a desktop widget that shows the total amount of oil spilled so far odometer-style; you can adjust flow rate and total spillage and barrels/min will conform after your movement of a slider. That figures. The folks at NPR and PBS just cannot wait until the planet is not just oil-free and carbon dioxide-free and trash-free but human-free as well.